The Crimea (officially Autonomous Republic of Crimea, Ukrainian transliteration: Avtonomna Respublika Krym, Ukrainian: Автономна Республіка Крим, Russian: Автономная Республика Крым, pronounced cry-MEE-ah in English) is a peninsula and an autonomous republic of Ukraine on the northern coast of the Black Sea. The name is derived from the original Crimean Tatar name Qırım, via the Russian: Крым (Krym). It was called Tauric or Scythian Chersonese (Chersonesus Taurica or Scythica) by the ancient Greeks. It borders the Kherson region from the North; the rest of the border is the Black Sea in the South and West and the Sea of Azov in the East. Its area is 26,100 square kilometres with a population of 2.0 million (2004-05-01). The capital is Simferopol. 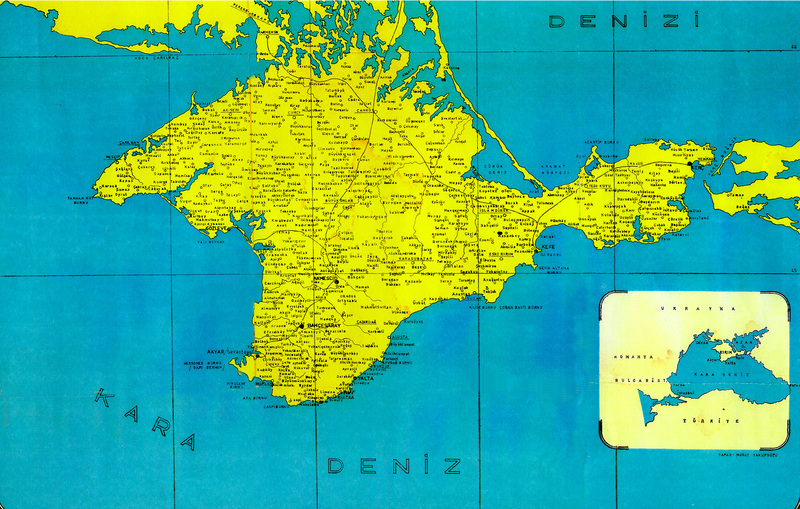 Crimea is connected to the Ukrainian mainland by the 5–7 kilometre (3–4 mile) wide Isthmus of Perekop. At the eastern tip is the Kerch Peninsula, which is directly opposite the Taman Peninsula on the Russian mainland. Between the Kerch and Taman peninsula lies the 3–13 km (2–9 mi) wide Kerch Strait, which connects the Black Sea with the Sea of Azov. The Crimean coastline is broken by several bays and harbours. These harbours lie on the west side of the Isthmus of Perekop by the Bay of Karkinit; on the south-west by the open Bay of Kalamita, with the ports of Eupatoria, Sevastopol and Balaklava; by the Bay of Arabat on the north side of the Isthmus of Yenikale or Kerch; and by the Bay of Kaffa or Feodosiya (Theodosia), with the port of that name on the south side. The south-east coast is flanked at a distance of 8–12 km (5–8 mi) from the sea by a parallel range of mountains, the Yayla-Dagh, or Alpine Meadow mountains (also known as the Crimean Range). These mountains are backed by secondary parallel ranges. 75% of the remaining area of the Crimea consists of semiarid prairie lands, a southward continuation of the Pontic steppes, which slope gently to the north-west from the foot of the Yayla-Dagh. The main range of these mountains shoots up with extraordinary abruptness from the deep floor of the Black Sea to an altitude of 600 to 750 metres (2000 to 2500 feet), beginning at the south-west point of the peninsula, called Cape Fiolente (anc. Parthenium). It was this cape that was supposedly crowned with the temple of Artemis, where Iphigeneia is said to have officiated as priestess. Numerous kurgans, or burial-mounds, of the ancient Scythians are scattered across the Crimean steppes. The terrain that lies beyond the sheltering Yayla-Dagh range is of an altogether different character. Here the narrow strip of coast and the slopes of the mountains are smothered with greenery. This "Russian Riviera" stretches along the south-east coast from Cape Sarych, in the extreme south, to Feodosiya and is studded with summer sea-bathing resorts such as Alupka, Yalta, Gurzuf, Sudak, and Feodosiya. During the years of Soviet rule, the resorts and dachas of this coast served as the prime perquisites of the politically loyal. In this region are also vineyards and fruit orchards; fishing, mining, and the production of essential oils are also important. Numerous Crimean Tatar villages, mosques, monasteries, and palaces of the Russian imperial family and nobles are found here, as well as picturesque ancient Greek and medieval castles. The earliest inhabitants of whom we have any authentic traces were the Cimmerians, who were expelled by the Scythians during the 7th century BC. A remnant that took refuge in the mountains became known subsequently as the Tauri. In that same century, Greek colonists began to settle on the coasts, e.g. Dorians from Heraclea at Chersonesus, and Ionians from Miletus at Theodosia and Panticapaeum (also called Bosporus). Two centuries later (438 BC) the archon, or ruler, of the last-named assumed the title King of Bosporus, a state that maintained close relations with Athens, supplying that city with wheat and other commodities. The last of these kings, Paerisades V, being hard pressed by the Scythians, put himself under the protection of Mithradates VI, king of Pontus, in 114 BC. After the death of this latter sovereign, his son Pharnaces, as a reward for assistance rendered to the Romans in their war against his father, was in 63 BC invested by Pompey with the kingdom of Bosporus. In 15 BC it was once more restored to the king of Pontus, but henceforward ranked as a tributary state of Rome. During the succeeding centuries the Crimea was overrun or occupied successively by the Goths (AD. 250), the Huns (376), the Bulgars (5th century), the Khazars (8th century), Kievan Rus (10th-11th centuries), the Byzantine Greeks (1016), the Kipchaks (1050), and the Mongols (1237). In the mid 10th century eastern Crimea was conqured by Sviatoslav I of Kiev and became part of Kievan Russian Tmutarakan. In 988 Vladimir I of Kiev also captured the Byzantine town of Chersones and later converted to Christianity there. In the 13th century the Genoese seized the settlements which their rivals the Venetians had made on the Crimean coasts and established themselves at Eupatoria, Cembalo, Soldaia, and Caffa. Meanwhile the Turkic peoples, now known as Crimean Tatars, had been living around the peninsula since the Huns. A small enclave of the Karaites dwelled among the Crimean Tatars, principally in Chufut Kale. After the destruction of the Golden Horde by Timur, they founded an independent Crimean Khanate in 1441 under Haci Giray, a descendant of Genghis Khan. He and his successors reigned first at Solkhat (Eski-Qırım), and from the beginning of the 15th century, at Bakhchisaray. The trading towns in the Genoese hold were conquered by the Ottoman Turkish general Gedik Ahmet Pasha in 1475. After 1475, the Crimean Khans ruled as tributary princes of the Ottoman Empire until 1774 when they fell under Russian influence. Later in 1783, the whole of the Crimea was annexed by the Russian Empire. The Crimean War, which took place between 1854 and 1856, devastated the economic and social structure of Crimea. Crimean Tatars had to leave their homeland en masse, forced by the conditions created by the war, persecution and land confiscation. Those who survived the trip, famine and disease resettled in Dobrogea, Anatolia, and other parts of the Ottoman Empire. For the first time in history, Crimean Tatars became a minority in their own land, with the majority living in the diaspora. Finally, the Russian government decided to stop the process, as the agriculture began to suffer due to deserted fertile lands. During the Russian Civil War Crimea was a stronghold of the anti-Bolshevik White Army, and in Crimea the Russian Whites led by General Wrangel made their last stand against the Red army in 1920. In 1921 the Crimean Autonomous Soviet Socialist Republic was created as part of Russian SFSR. Crimea was the scene of some of the most bloody battles in World War II. The Germans suffered heavy casualties as they tried to advance through the isthmus linking Crimea to the Ukrainian mainland at Perekop in the summer of 1941. Once the Germans broke through, they occupied most of Crimea, with the exception of the city of Sevastopol (given the title of Hero City later). Sevastopol held out from October 1941 until July 4, 1942, when the Germans finally took control over the city until May, 1944, when they were driven out by the Soviet Army. On 18 May 1944 the entire population of the Crimean Tatars were forcibly deported by Stalin's Soviet government as a form of collective punishment. On 21 May 1944, the ethnic cleansing of the Crimea was complete. An estimated 46% of deportees died from hunger and disease. In 1967, the Crimean Tatars were rehabilitated, but they were banned from legally returning to their homeland until the last days of the Soviet Union. The Crimean Autonomous Soviet Socialist Republic was abolished in 1945 and transformed into Crimean Province, Russian SFSR. In 1954, it was transferred by Khrushchev to the Ukrainian SSR as a gift to mark the 300th anniversary of unification of Russia and Ukraine. With the collapse of the Soviet Union, the Crimea became part of the newly independent Ukraine, a situation resented by a part of its mainly Russian population and a cause of tensions between Russia and Ukraine. With the Black Sea Fleet based on the peninsula, there were worries of armed conflict. With the electoral defeat of the more radical nationalist political forces in Ukraine tension slowly eased. The Crimea proclaimed self-rule on May 5, 1992, but later agreed to remain within Ukraine as an autonomous Republic. The city of Sevastopol is located within the republic, but it has a special municipality status in Ukraine. The official languages of Crimea are Ukrainian and Russian. The Crimean Tatar language is not officially recognized. Other languages spoken are Hungarian, Polish, and Romanian. This page was last modified 01:24, 19 Jun 2005. This page has been accessed 13319 times.